Chibeze is an Environmentalist with years of working experience in the Natural Resources and Environmental (NRE) sector. He is a certified Youth Master Trainer on Climate Change by the World Bank Institute and has acquired professional training in various important areas such as Policy Analyst, Energy Access and Gender Mainstreaming. He serves as the Exec. Coordinator of the Strategic Youth Network for Development (SYND). 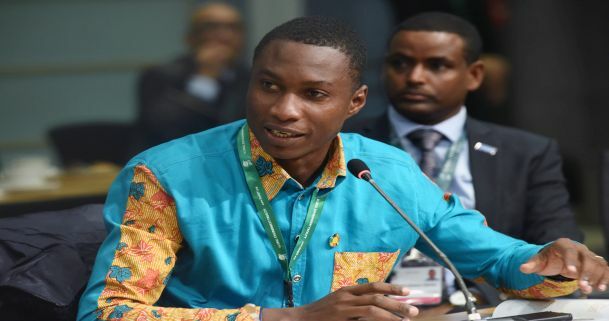 Ghanaian Youth Participation in Governance: A Mere Act of Symbolism! The National Youth Policy of Ghana: A Dead Corpse worth resurrecting! On August 12, 2010, I was among a host of young people who participated in the launch of the National Youth Policy in Elmina, Cape Coast by His Excellency President John Dramani Mahama (then the Vice President of Ghana). So far, I think the policy is essential – at least we have a document which is quite comprehensive than the 1999 version and also provides a guide towards achieving youth development in Ghana. The next important step was the development of an Action Plan to give life to the policy. It’s over 3 years since the launch of the policy and yet government has failed to produce any action plan. This reminds me of a paper entitled, The Youth in Ghana and the African Youth Charter, written by Dr. Ransford Gyampo, a Senior Lecturer at the Department of Political Science (University of Ghana) made some interesting observations. According him, “the structures that formulate youth policies are different from those that handle national development policies. In many instances, the government employs a consultant through the Ministry of Youth and Sports to formulate such policies which are then discussed and approved by cabinet and forwarded to the relevant agencies for implementation (Akomea, 2009). Unlike national development policies, youth policies are usually not presented to parliament, and therefore are easily abandoned by successor governments (Donkor, 2010). When the NPP came to power in 2001, it abandoned the 1999 National Youth Policy and took two terms in office to formulate the …2008 National Youth Policy. The NDC abandoned the 2008 youth policy formulated by its predecessor and introduced a new one in 2010. There is no guarantee that the 2010 youth policy would also allowed to serve as a guide to youth development should the NDC lose future elections…” During the latter part of 2012, some selected youth leaders including myself were invited by the National Youth Authority (NYA) to a National Consultative Workshop in Accra. The object of the workshop was to make inputs into a supposed draft action plan. After careful analysis and scrutiny of the documents, it turned out that participants’ present expressed dissatisfaction on the overall content of the document. In the 2013 Budget Statement, it was stated that the NYA had embarked on a regional tour to solicit ideas from different youth groups which led to the draft action plan after collating those information. Paragraph 631 specifically notes that “… 500 youth with varied backgrounds participated in youth dialogues to solicit inputs for the Youth Policy Action Plan in four Zones nationwide”. I have asked ‘who were the specific youth groups invited in the regions and what were the criteria for selection and whether there was equal representation across the nation?’ Unfortunately, I have still not received answers to these questions. The NYA is the arm of government under the Ministry of Youth and Sports mandated to shoulder such role or responsible. As to whether the NYA is living up to expectation is another subject for discussion. Indeed in May 2011, I published an article entitled “The National Youth Council: A bane or blessing” which till date is provoking several and different responses and/or reactions. I still maintain my position that NYA’s performance with respect to developing and pursuing pragmatic and comprehensive youth development is woefully inadequate! Meanwhile, paragraph 1152 of the 2012 Budget Statement states that “… the National Youth Authority will be provided with GH¢2 million for the Youth Policy”. We have (still) not been told what this budgetary allocation seeks to achieve and even how much was actually disbursed. So far I am not enthused with the efforts of NYA in creating awareness and/or disseminating the Youth Policy. Section 11.2.1 of the Policy reads that “the policy shall be reviewed when necessary (but at least once in every five years) and in line with other government policies”. It’s more than 3 years since the insertion of this ‘lifeless’ policy; so would it be reviewed after the next 2 years? It will be interesting to see how a policy will be reviewed when it has not been tested? While the youth policy of Ghana currently remains dead for lack of an Action Plan, I believe some efforts can be put in place to breathe some life into it. My recommendations are as follows: 1. NYA should liaise with organized student groups such as National Union of Ghana Students (NUGS), PUSAG, and GUNSA by using their existing platforms or networks to educate or create more awareness on the policy. Similar effort should be targeted at organized informal youth groups such as the hairdressers, barbering, and dressmaking associations. 2.NYA should ensure that all Sector Ministries or MMDAs take into consideration youth inputs in the formulation, review and/or implementation of their respective policies and/or programmes. In so doing, young people can better understand and appreciate developmental issues as they make their inputs in the policies and programs of these MMDAs. The NYA should organize the youth groups in their database and play a coordination role between the groups and the respective government MMDAs. For example, health-focused youth groups can be connected to the Ministry of Health, Ghana Health Services and other allied stakeholders. 3.NYA should develop a periodic ‘youth and media encounter’ sessions to showcase talents and ideas of young people contributing in various ways towards national development as well as deepening positive lifestyle or culture. In conclusion, Youth inclusion in decision making processes at all levels has been widely preached and documented (references in the African Youth Charter, Lisbon Declaration on Youth Policies and Programmes & World Programme of Action for Youth to the Year 2000 and Beyond). Though Ghana is striving to include youth in decision-making processes, a lot more needs to be done. Indeed youth are commonly perceived as a problem rather than as a valuable resource. The role of youth needs to be elaborated. As change agents, as a pool of energies, talents, innovation and new ideas, as networkers and motivators, and as the next generation that is going to inherit the results or outcomes of current established systems, youth cannot be marginalized as a key stakeholder in development. For the sake of sustainability it is imperative that youth are deliberately and actively engaged at all levels of development. The vision of the National Youth Policy as captured in Section 5.1 is “an empowered youth contributing positively to national development”. Unfortunately, the policy itself needs empowerment! The National Youth Policy as it stands now is a DEAD CORPSE that needs to be RESURRECTED with the aid of an action plan. Thus, government without delay should provide all the necessary resources and assistance to propel an effective and efficient youth development interventions. Undoubtedly, the youth of Ghana deserve the BEST!